Electronic ear muffs are by far the most versatile form of hearing protection, with powerful capabilities especially designed for industry workers, hunters and shooters, and even DIY home improvement weekend warriors. From the factory floor to the front lawn, electronic ear muffs bring many unique and specialized benefits to the table. Electronic ear muffs' enhanced capabilities make them an unbeatable hearing protection choice for a wide range of specialized applications. 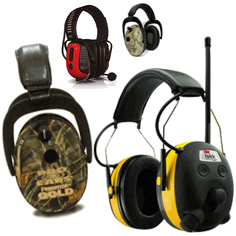 Browse the electronic ear muff product categories below to learn more. Our electronic ear muffs department includes electronic shooter's ear muffs that amplify sound but shut off instantly when a loud noise strikes the ear cup, and similar ear muffs that are made specifically for tactical police and military ops. Face-To-Face Communication Ear Muffs allow industrial workers to easily speak to and hear one another in high noise environments without ever needing to remove their hearing protection ear muffs. No microphones or radios are required, so workers may communicate naturally, face-to-face. BlueTooth connectivity has come of age. BlueTooth is hands-down the best way to connect to your smartphone for music listening, but now BlueTooth headsets are also a great way to facilitate communications and get rid of the wires required by old-fashioned connection methods. By using this new technology, full duplex conversations can be held using BlueTooth compatible headsets coupled with your existing smartphone, BlueTooth enabled two way radio, and in some cases, direct BlueTooth connectivity between headsets. We believe this technology can solve many of the communications problems you may have in loud environments, and at a much lower price point. We encourage you to check out our list of BlueTooth compatible headsets and check back often. We are focused on bringing more options to you as quickly as we can find them. 2-Way Communication Ear Muffs for Use With External Radio facilitate safe 2-way radio communications in high-noise environments, and each set of ear muffs includes both a microphone and an input jack to connect with your current 2-way radio. These are the ideal solution for very loud environments in which members of a team of two or more need to maintain communications and still have continuous protection from hazardous environmental noise. 2-Way Communication Ear Muffs with Built-In Radio provide safe 2-way radio communications in high-noise environments, and each set of ear muffs includes a mic and a fully-functioning radio unit - no external radios or other devices required. These are the ideal solution for very loud environments in which members of a team of two or more need to maintain communications and still have continuous protection from hazardous environmental noise. Two-way radio communications electronic ear muffs are a necessity in police and military work, as well as in many industrial settings. When you must wear a hearing protector, why not wear one that lets you enjoy a built in radio while you work? Worktunes by Peltor and AO Safety are the category leaders, but we offer a number of other brands of ear muffs with built-in radios as well. Intrinsically Safe Communication Ear Muffs provide the benefits of hearing protection and communications capabilities in even the most hazardous of environments. With speech enhancement for face-to-face communications, BlueTooth connectivity, and built in short range 2-way radio capabilities, these are some of the most advanced IS communications devices available.